Remarks:CHIR-124 is a quinolone-based small molecule Chk1 inhibitor, that is structurally unrelated to other known inhibitors of Chk1. 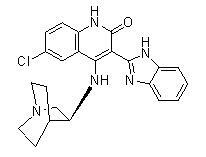 It potently and selectively inhibits Chk1 in vitro (IC(50) = 0.0003 micromol/L). CHIR-124 interacts synergistically with topoisomerase poisons (e.g., camptothecin or SN-38) in causing growth inhibition in several p53-mutant solid tumor cell lines as determined by isobologram or response surface analysis. CHIR-124 is a novel and potent Chk1 inhibitor with promising antitumor activities when used in combination with topoisomerase I poisons.